Will Carrasco bring her Portuguese story full circle? Three hundred and sixty-four days. This Sunday, when the lights go out on the penultimate FIM Supersport 300 World Championship race of 2018, it will be twenty-four hours short of a year since Ana Carrasco (DS Junior Team) became the talk of the sporting world. Fifty-three thousandths of a second in Portugal was all it took then: she became the first woman to win a world championship race, in the blink of an eye. The famed rollercoaster track started a rollercoaster year for Carrasco. She scored just two points more in 2017, then changed teams, took her first pole position, won back-to-back races, and became the FIM Supersport 300 World Championship leader. The road from that first win at the Autodromo Internacional do Algarve has taken her from unprecedented feat to unprecedented feat, and her next chance to take a swipe at history comes, fittingly, where it all began in Algarve. The chance for the story to come full circle, from one history book moment to another. A Carrasco win would put two of her fiercest rivals mathematically out of contention – so expect them to fight, scratch and claw. Borja Sánchez (ETG Racing) crashed out after one lap at Misano, but he has also finished three consecutive times on the rostrum this season, more than anyone else in the series. The Spaniard remains a talented and dangerous rival on the Ninja 400, despite his 26-point deficit with the championship leader. Three points behind Sánchez is Scott Deroue (Motoport Kawasaki). The Dutchman was leading in Rimini when mechanical issues ended his Sunday early through no fault of his own. With pace on his side, Deroue will be aiming to take his first win since Assen 2017 and keep his championship options alive going into the final showdown at Magny-Cours. 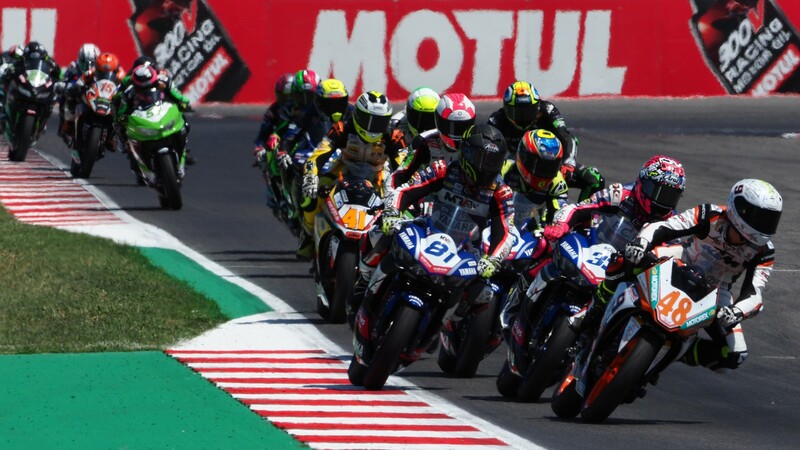 For the rest of the riders in the championship race a win at Portimao may not be enough to make it to France with options, but that will not hinder their motivation in Portugal. Dorren Loureiro (DS Junior Team) will be looking to match his teammate’s efforts this year and leave 2018 with his first win, after taking a meritorious second place at Donington Park earlier in May, along with several top ten results. Despite his two no-scores at the start of the season, Galang Hendra Pratama (BIBLION YAMAHA MOTOXRACING) remains in the mix in sixth position in the standings, 32 points from the lead and tied with Mika Pérez (Kawasaki ParkinGO Team), who also has two zeroes to his name. Both men have been permanent fixtures in the top ten whenever they’ve been able to finish a race and hold several wins between them – neither rider is out of this battle just yet. The first of the last two World Supersport 300 battles takes place on Sunday at the Autodromo Internacional do Algarve! Will the title get decided in Portugal? Find out live thanks to WorldSBK VideoPass.